Don’t suffer in the cold. Open one of these Heat Factory® Heat Packs and get toasty. Compact and safe. Activated when opened. 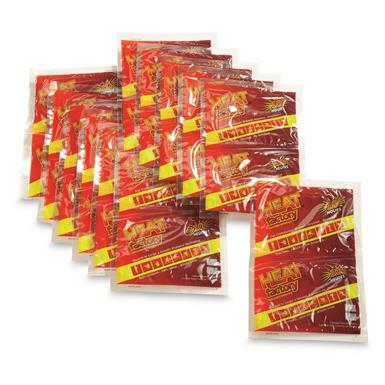 Heat Factory Heat Packs, 24 Pack is rated 4.4 out of 5 by 22. Rated 4 out of 5 by concernedconsumer from Dependable Product I have been using Heat Factory warmers since the late 90's and have relied on them to keep warm whether it has been at my feet in a sleeping bag outside winter camping/dog sledding in the Boundary Waters or just the usual winter commute waiting for the bus. I have tried their competitors but none have been as reliable. Rated 5 out of 5 by MARY S from Even in the middle of a big city, we need hand-warmers, but the stores frequently run out at certain times of day. I'm very glad to be able to order my own supply in large quantities at a low price. Rated 5 out of 5 by STEPHEN from These are great in my mittens or the muff hand warmer. Rated 4 out of 5 by ROBERT from This shipment was a different brand than my last, hopefully these work as well as the previous ones. Rated 5 out of 5 by GERARD from Worked well will reorder. Rated 5 out of 5 by T.E. from Will try in Nov. Rated 5 out of 5 by TIMOTHY / KIM from Love these things.